Routesetting is an awesome job. Creating an overlap between passion and career is something I imagine everyone searches for and we’ve all been lucky enough to find a small piece of that as routesetters. Nonethless, it’s still a job. And every now and then it’s nice to put the plastic down, head outdoors, and remind ourselves why we love this sport. For anyone who has never been to or even heard of Joe’s Valley, it’s one of the premier bouldering destinations in the country. Textured sandstone boulders line the valley’s hillsides, most of which are a literal stone’s throw from the car. Hundreds of boulders, short approaches, and primarily flat landings make Joe’s a bouldering mecca. The trip served as a getaway, some team building amongst ourselves, and most importantly finding inspiration in movement that nature set for us, so we could that back to our gym and our climbs! Here are some photos of the more memorable moments of the trip. Anders cruised the massive Buoux crack. And check this out! The left-hand start to the boulder ‘Bowling Ball’ in the Buoux Area of Right Fork has an eerily similar shape to our bear claw hold from the eGrips limestone pocket series. The nature of this hold means it generally finds a home on the harder boulders in the gym. Keep your eye out for the next time you see it on the wall! A big shout out to Anders Rasker for capturing all the awesome climbing moments. He also got a couple great shots of our humble campsite and evening fire with the beautiful desert sky backdrop. It’s nice to have made it outside for a weekend before winter found its way to Joe’s. If you’re looking for a place for your next outdoor bouldering trip Joe’s Valley is highly recommended. There’s a slew of high-concentration boulders in every grade range with virtually no approach and easy camping. There isn’t much more an avid boulderer could ask for. We’re happy to be home and eager to fill our walls with quality boulders to keep you in shape physically and mentally over the winter season! Between the crew, we have easily accumulated dozens if not hundreds of visits to this bouldering mecca so if you see us setting and have questions about camping beta or our favorite boulders please don’t hesitate to ask! Anyone who has been to Psychedelia before knows that the atmosphere created in the gym is an experience unlike any other. When you take your first steps through the pitch black tunnel you’re transported into another world. As you look around the fluorescent neon envelops your eyeballs. Everywhere you look things are glowing with hues you’ve never seen before. There are slides stuck to the walls, bones hanging from the boulders, and even a coffin you need to close yourself into to send. It’s like a vibrant buffet for your retinas. The first few seconds you forget you even came to climb as your brain struggles to catch up with the images received from your wide-open eyeballs. It’s an experience you really cannot find anywhere else. One of the most punch-packing features of all the Psychedelia artwork is the tape art scenery featured on the beach, done by one of our very own routesetters, Hunter Damiani. Every year seems to top the previous as Hunter’s work gets more detailed, more ambitious, and more creative. Taking dozens of hours across multiple days, Hunter finds a way to turn a blank climbing wall into a scene even the most fantastical imaginations couldn’t believe. Some of Hunter’s past works help elaborate on his growth and creativity with this unique art form. Let’s start with 2013. The beach featured a Día de los Muertos calavera looming over the center of the wall accompanied by smaller flower features. The size and positioning of the decorative skull made it feel like it was watching over the entire gym, reminiscent of Sauron’s all-seeing eye. The next year was consistent with another giant head, this time an alien with some of the most impeccable facial detail. The men’s final boulder climbed right through the eyeball/spaceship bringing everyone’s attention to the imposing green face. Check out the size of this bad boy compared to the climber on the wall! In 2015 for our Dr. Suess theme, Hunter turned your favorite childhood author into a real-life playground. The next year was absolutely nuts. 2016 was a personal favorite of mine. The theme was Lost at Sea and Hunter really made this one pop. Not only was there a massive 18-foot-tall Spongebob enjoying some casual jellyfishing, but just about every main character from the show made an appearance. The entire beach was utilized to create an jaw-dropping scene from one of pop culture’s favorite cartoons. Or doing a dyno move to squish a Goomba-painted volume straight out of Super Mario Bros! How cool is that? One thing is for sure, it’s going to be hard to top last year. But if you think we aren’t going to go all out to make sure that happens you don’t know The Spot. This year the theme is Welcome to the Jungle and although I can’t give anyway any secrets, I can say the beach tape art is going to be ridiculous! You don’t want to miss it, believe me. Don’t miss out on this year’s action. Register today. This event regularly sells out to make sure to get your tickets while you can! Last but not least, a big shout out to the man with the calloused, tape-tearing fingers: Hunter Damiani. These projects take hours and we’re thankful for the time he puts in to help make this event that much better. For more, check out this awesome time-lapse of some of Hunter’s previous work being constructed, and the rest of our Psychedelia photo collection on the event page. Follow Hunter. And catch more of him and the rest of your setting crew on our Instagram. The Spot Classic was, as always, an awesome show! As usual with comps at The Spot, Avery and Cosmo’s brought the party and this city’s ridiculously strong climbers brought the show. Finals was a blast. Jeff McCallister edged out a strong men’s field for first place in Finals while Matt Fultz and Brett Walker got second and third. Ella Von Dungen brought it home for the women with Natalia Grossman taking second and Ashley Fisher taking third. As for the morning USAC sessions, we were pleased to see kids in Youth C and D (that’s competitors up to age 13) sending all the way up through O3! As I touched on in the last post, setting for diverse age groups and body types is a tall task. That challenge is further amplified when we’re talking about kids a third of the age and height of the adults who compete on the same boulders in the evening. There were 50 climbs in the gym set for The Classic. Ten climbs in each of five categories: youth, recreation, intermediate, advanced, and open. This means that some of the smallest and youngest competitors were capable of sending 43/50 climbs in the gym! Unreal. From a setting perspective, we were definitely thrilled. We also had two awesome guest setters. Shout out to Jason Brownlee and Blayke Huffman for bringing some of their spice to the gym. It was a pleasure working with them and we hope to see their faces again soon. Creating boulders for competitions is a bit different than creating boulders for the traditional commercial setting. For starters, we strip the entire gym and replace it with a total of 50 boulders. (Sometimes there’s close to 50 on the beach alone!) This means that the problems that are on the wall are more spread out in order to be easily accessible to a gym full of climbers all at once. Giving the boulders a little extra room to breathe means that their appearance and aesthetic qualities are of a bit more importance than normal. Not unlike a fancy chef presenting a dish that pleases the eyes as much as the palate, we aim to set boulders that look as fun and enticing as they are to actually climb. Additionally, from a logistics standpoint, there is a lot more attention to detail than normal. Obviously, we don’t have enough space for 50 completely stand alone problems, so there is inevitably some mingling of routes. What we can do to mitigate potential traffic jams is make sure there’s a good spread of easy and hard boulders to facilitate a diverse climbing base. If a youth boulder crosses an open boulder we’ll probably be okay. Chances are the youth climber isn’t sending five spot (though not guaranteed in this town) and the strong men and women trying to make finals won’t be hopping on a 10-foot-tall youth climb. All things considered, both the early USAC sessions and the adult evening session went smoothly. A success for us! Another one of our priorities in competition setting is ensuring that each division is made up of a range of climbing styles. It’s been said that those who perform best in climbing comps aren’t necessarily the strongest climber, but rather the climber with the fewest weaknesses. This is because a good routesetting staff is trying to make sure that there are movements of all types and a variety of hold styles within the ten climbs. From pinches and dynos to crimps and technical footwork, our ideal set is one full of diversity. Not to say that diverse climbs aren’t a goal of ours all the time, just that it is especially important, in a competition where each climber is only scored on five climbs, to make sure someone can’t just crimp their way into finals. As much as aesthetics and diversity matter though, we can’t forget one thing: this is a competition with spectators who paid to come watch! That means we want to put on a show! Both men and women’s final boulders featured an all-points-off dyno, something much more unique to gym climbing than outdoor climbing. Although dynamic movement and big throws certainly exist outdoors, they are much more prevalent in indoor climbing and especially bouldering. As much as some people can probably stand to see it, climbing is becoming a spectator sport more and more each day. It’s exciting, dramatic, powerful, and intense watching someone throw themselves through space with only their hands capable of reeling their momentum back towards the wall. Even at the IFSC World Championships last week we saw a dyno, or at least a dynamic gymnastics style movement, in all four boulders in men’s finals. In fact, there was not a single fall in men’s finals from a static movement where both feet were on the wall. It’s probably safe to assume that this powerful, dynamic trend in competition routesetting is in preparation for the 2020 Olympics. Spectator sports need, well, spectators. And a non-climber can relate to the difficulty of seeing a human being hurling themselves through time and space much more easily than they can to seeing someone stand on tiny bits of plastic or pulling hard on credit card crimps. It’s worth noting that the Olympic format has athletes competing in three styles of competition climbing: speed, lead, and bouldering. Dynos are a part of climbing, so if the aim really is to find the best all-around climber than Olympic routesetters will likely want to test climbers on as many styles of movement as possible, including jumps and crazy power moves. It’s hard to deny that bouldering as a climbing style caters to low percentage dyno moves more so than lead climbing can. After a failure in bouldering, a climber can simply step up and try again, whereas in lead climbing it would mean that their attempt is over and that’s as far as they get on the scorecard. Like it or not this has been where competition bouldering has been heading, and it doesn’t show signs of letting up. I may be getting a bit off topic, but we were talking about competition climbing after all, right? Anyway, The Classic was an all-around awesome event. If there’s one thing we know how to do at The Spot it is throw an awesome party. And speaking of awesome parties, I would be remiss not to mention that the single coolest climbing competition probably in the entire world is happening NEXT MONTH and you should be there. I’m talking Psychedelia, baby! It’s only a month away. 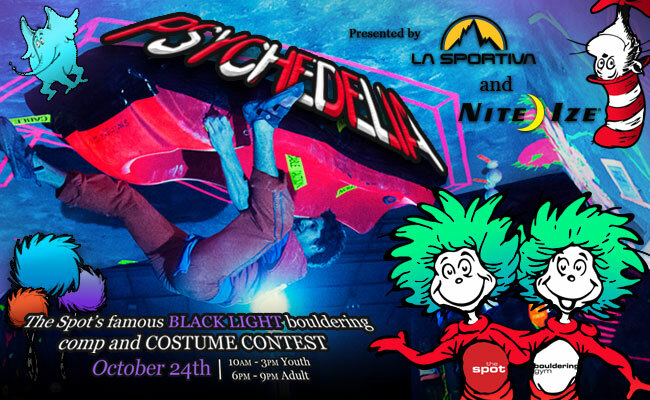 On October 20th we will be hosting our annual blacklight climbing competition. If you haven’t been, you need to. This isn’t just a climbing competition, it’s an experience. 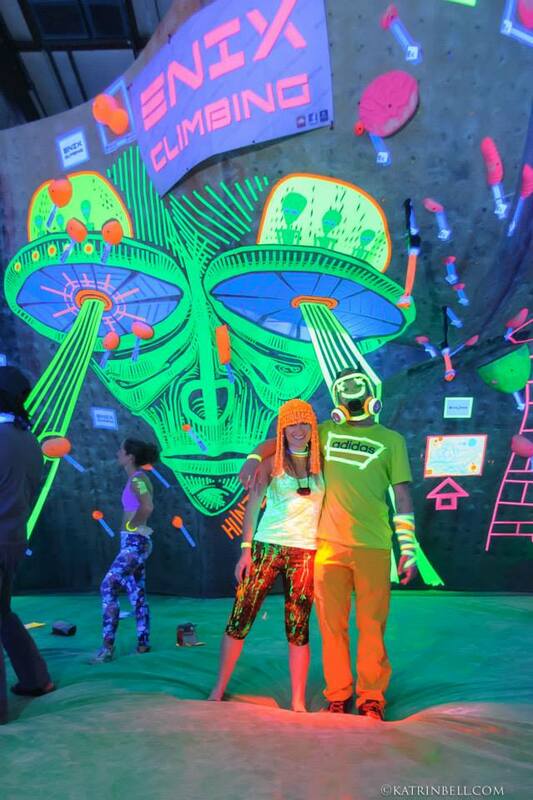 The tape art, the glowing climbing holds, the rad costumes… oh, and did I mention… the Avery BEER! The theme this year is Welcome to the Jungle so get your costumes ready! If you need some insight into what works well under blacklight and what doesn’t check out Jackie’s always popular comprehensive Psychedelia guide. The environment is insane, the climbs are hilarious and unique (they generally feature hanging barrels, coffins, rope swings, you name it), and the Hunter Damiani tape art is an absolute can’t miss. I hope you’re here for your sake, it’s an experience you really don’t want to miss. And as always, we want to hear from you. How was your Spot Classic experience? Let us know in the comments what you thought about the climbs, the flow, the finals, whatever. You can expect Psychedelia to feature some more creative climbs and fun setting. What features do you want to see this year? (Tarzan rope swing, anyone?) We hope to see you there! Anyone who was a reader of our routesetting blog in the past may have noticed that there’s been a bit of a hiatus in posts. Our old blog author, Jackie Hueftle and previous Head Routesetter, manned the ship when she was the head setter at The Spot. She has since moved on to develop the climbing company she co-founded: Kilter Grips. Now, under current head setter Sarah Filler, I hope to maintain the same standard in continuing this blog. The purpose of these posts will be to help educate our members about the burgeoning world of routesetting by peeling back the curtains to show you what we do day in and day out. With that said, what’s been happening while we were away? It’s no secret that the climbing gym industry has been booming. With climbing entering the 2020 Olympics it’s fair to say there is more noise in the climbing industry now than ever before. In fact, climbing gym growth rates have not dipped below 6% each year since 2010, and it’s not just big names. 25 of last year’s newly opened gyms were opened by people doing so for the very first time. What does this growth mean for the industry? And more specifically, what does this mean for routesetting? The explosion of new gyms across the country has brought with it a surge in jobs in the world of routesetting. What was once a part-time gig for dirtbags and van dwellers has become a viable career with titles including ‘head’, ‘regional’ and ‘director of.’ Things are changing and change brings new challenges. How will such a nascent industry handle the battle between a constant push for growth and such an extreme desire for experience? A routesetter who is conscious of these attributes will see more success than one who is not. This is important because climbing gyms ultimately have a single product. Behind the ubiquitous merch, snacks, and campus boards there’s a sole product that separates one climbing gym from another… the climbs themselves. Since opening its doors in 2002 as the first bouldering exclusive gym in the country, The Spot has taken pride in its routesetting and has constantly strived to stay at the top. As the push towards mainstream climbing continues we don’t plan to stray from this pursuit. But, as climbing grows, so does the number of challenges. Climbing gyms have to serve a wildly diverse audience. Gym owners and routesetters have to consider a variety of potential clientele. You have the old school tryhards who want climbing that mimics the outdoors so they can train in the offseason and send their projects. You have youth teams that want competition style climbing, with run-and-jumps, dynos, power moves, and intricate and creative beta to practice on-sighting for comps. Then there are the gym rats who spend so much time on your walls they get bored with the new set after the first two days. And last but not least, there are the newcomers who have never put their foot in a climbing shoe and want approachable, safe, fun climbs that are within their skill level but don’t feel like the ladder they climb to clean their gutters. Ultimately, setting for such a wide cast of climbers can prove to be a challenge. It turns out that setting for a 6’3” power climber while considering the 5’2” crimp master is difficult. And while there is an argument to made that not every single climb can or should be sent by every single body type, there’s incentive to strive for just that. There’s only so many square feet of wall in a gym so more inclusivity makes for a friendlier user experience. It’s important to recognize that this diversity contributes to what makes climbing such a truly awesome experience to so many people. Climbing with friends that have different bodies than you is half of what makes this sport so exciting. Seeing new ways to take down a climb, figuring out your own way up the wall, and not being limited to having a climbing partner with exactly your height, reach, and body type is a large part of what makes this sport so personally rewarding and unique to each individual. This is why a good setter tries hard to think about and accommodate every type of climber. As the industry continues to grow, gyms that can consistently produce this type of setting will see more success. Boulder has been a climbing mecca for so long that we’ve been spoiled with the luxury of choice in climbing gyms for years. Not so for a large part of the country. Many people across the country have a single choice of local gym, if they have a local gym at all. And if they want to train indoors they have to spend their time there whether the sets are fun or not. But that’s changing. The gyms with the best climbing will quickly stand out. Climbing gyms are different than conventional gyms in that new equipment and fancy treadmills aren’t enough to entice new members. The beauty of climbing gyms, as opposed to conventional gyms, is that they provide a dynamic, subjective experience. It changes with each visit. It engages your brain. It encourages social interactions. It’s fun. The massive industry growth combined with the subjectivity of routesetting is transforming what was once a paid hobby into a professional craft with individuals seeking to learn, improve, and develop their skills to be the best. Routesetting is a commodity that will be the difference in making or breaking the success of gyms both new and old. With all of this in mind, we will continually try and improve on the climbing that The Spot has already been masterfully cultivating for fifteen years. In an effort to stay ahead of the pack, we are asking YOU, the customer, what you would like to see from your routsetting. That means we always want feedback from you. How are we doing? What do you think of the climbs and what would you like to see more of? Ultimately, we’re setting for you, and we want to get better at what we do in order to improve your climbing experience. Feedback is always welcome and wanted. As this blog develops we hope it will provide quality insight into the routesetting world: the process, the challenges, and the fun. We want to show you what we do, why we do it, and how we hope it benefits you. Check out our Instagram if you want to stay in touch and see more. I’m sure some have noticed the complete lack of new posts for the last year and a half. There are a few reasons for that, mostly that Jackie (that’s me) has been extremely busy with Kilter Climbing Grips (that’s my climbing hold company) and that none of the other setters have taken on the blog thus far. That said, this blog has lots of useful info on it and we’ve actually continued to add useful info (see the menus above, specifically the Big Hold Company Lists and the General Setting Info sections). 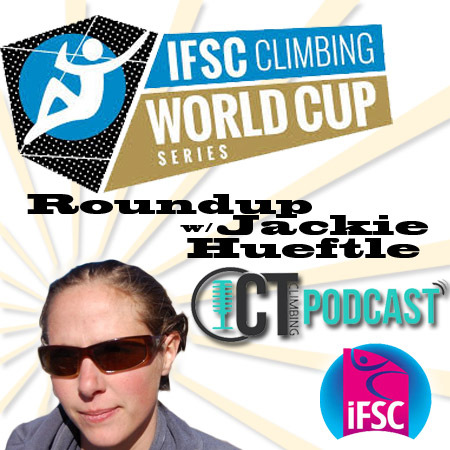 There’s also a lot of info here on past World Cups from when Jackie used to cover them in depth with photos and then links to the podcasts she did with John Blomquist and Chalk Talk over the past few years. For those reasons, the blog will live on for now as just a place to store these resources until such a time another setter takes on the joy of updating with our newest boulders of the week and other fun setting info. The Spot’s 2015 Psychedelia is almost here! This year we’re going all out with our Dr. Seuss theme, and we can’t wait to see what crazy Seussian costumes you all come up with. Remember this sick artwork Hunter Damiani did last year? He’s got big plans for this year as well. Click here to pre-register (recommended, this event will sell out) and more info on The Spot’s main website.